Everything Cat for Cat Lovers! Roll your cursor over the Menu at left. Click on any menu item to go directly that page. You'll also see flyout menus that will pop out to the right of the main menu, showing sub-categories of more specific products to help you find exactly what you need! Or, you can use the Product Search function in the right or left columns (you may need to scroll down a little) to look for a particular item. Eyes Bigger Than Your Wallet? Not to Worry! The first soft, outdoor heated bed on the market! The Lectro-Soft™ comes in 3 sizes and is extremely low wattage. Perfect for cat houses, basements, garages, barns, sheds, porches or any other outdoor shelter. This soft, orthopedic bed is unique in that it will still provide soft, comfortable warmth even in sub-zero weather! Super soft PVC is used on the exterior to ensure the bed doesn't absorb water and stay wet like a fabric bed would. Recommended for indoor and outdoor use. Great for cat houses, porches, garages, barns or in the home. Thermostatically controlled to warm to your cat's normal body temperature. For indoor or outdoor use. MET listed. One year limited warranty. Uses only 20 watts of electricity! Small measures 14" x 18"
Click here to visit our Cat Warming & Cooling Products section! Artist Kay Fazio's Abyssinian Cat Pendant in sterling silver has the characteristic dense ticked coat, beautiful almond shaped eyes, and arched elegant neck. You will surely recognize that friendly face with those dramatic Aby markings. He's almost seated with one paw up and has that "please let me help you" facial expression. The pendant is cast in solid .925 sterling silver and measures approximately 1.75" x 1". Hidden bail is approximately 6 mm. About the Abyssinian Cat: One of the oldest recognized breeds of cats, this one is named for the region from which British soldiers deployed in Africa first brought these cats to England in the 1800s. That area is now called Ethiopia, while other early "Abys" came from Egypt. They are medium-sized, highly energetic, intelligent, playful, loyal, and curious cats. Notable physical characteristics include their large ears, ticked reddish-brown coats, and expressive almond-shaped eyes. Abys love to be up high, so these cats need a tall perch from which to survey their domain. If you liked the Disney movie, The Cat From Outer Space, its high-flying star was an Abyssinian! Be aware that this is a hand-crafted piece of jewelry and the artist will make it after you place your order. These are not sitting around in a warehouse somewhere waiting to be shipped. Depending on her workload at the time she receives the order, it may take up to a month for you to receive your pendant. Eco-Friendly Concerned about the planet? Here are products you can feel good about buying for your cat, and for yourself, because they're made with eco-friendly and recycled materials, and are recyclable or non-toxic in the waste stream. Made in USA Want to support fellow Americans? Here are only products made in the good ol' U. S. of A. for cats and cat lovers. to log in and activate your Wish List! 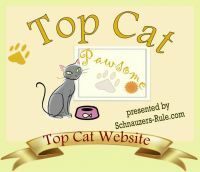 We love to locate cool and unusual products for cats and cat people! Click on the image of Frankie hunting, at left, to describe what you want. We'll do our best to track it down and offer it to you.